THE WORLD CUP IS HERE AND I GOT THE FEVER BABY. IT’S A MONTH OF FOOTBALL WITH 64 MATCHES AND WHAT EVEN ARE VIDEO GAMES WHO CARES. Hi. I’m Luke Plunkett, Senior Editor at Kotaku.com, and that’s pretty much me this entire month, at least any time I’m away from the keyboard. In previous World Cup years, to satisfy that kind of thirst, I’d have spent any time not involved watching real games by playing digital ones. From blessed 1998 through to 2014, that meant buying whatever game Electronic Arts had released to cash in on the tournament, often just a hastily re-skinned version of that year’s FIFA with an extra helping of official World Cup branding. The latest sports games are not always the best. In 2018, though, EA isn’t bothering. Taking a cue from rivals PES and their digital version of Euro 2016, there is no standalone World Cup game this time around. Instead, there’s just a free update for FIFA 18 called 2018 FIFA World Cup Russia. It launches from the main menu of FIFA 18, just like any other tournament, and once inside it you’re given a few options like playing friendlies or online matches. The meat of the update, though, is a recreation of the 2018 World Cup, which includes the tournament’s stadiums, each team’s correct and licensed kits and, perhaps most importantly, the same visual language (logos, score boxes, etc) that you’ll be seeing on TV watching the real thing. Compared to previous World Cup games, it’s pretty good! It’s a little thin in places—pre-game national anthem routines aren’t as detailed, and there aren’t many tournament-specific upgrades in the commentary—but it still does what it’s asked, namely take the already fine FIFA 18 and dress it up convincingly in the flavour of the month. Not that everything is authentic; there’s the option to create a fictional tournament and edit the list of qualified nations, which means despondent American, Italian and Dutch fans can pretend, if just for a few fleeting minutes at a time, that they’re part of the big dance and actually have a shot at winning. Or even just taking part. On the field, it’s pretty much FIFA 18, but there’s one new addition that I’ve been dying to see implemented for years. It’s a “suggested substitution” icon that pops up once a player is injured or tired, showing both their stats and the identity of an automatically-selected replacement. This comes up during gameplay, and you can make the selection happen using the left trigger without interrupting the action or returning to a menu screen. It sounds minor, and I guess in the grand scheme of things it is, but it’s something I’ve always struggled with during games (by simply forgetting to make subs), and in a tournament where matches are played only a few days after each other, it really helped manage the stamina of my best players. UPDATE - OK turns out this was in FIFA 18 already (I somehow completely missed it! ), but you had to turn it on. In this update, it’s on by default, and makes its own smart suggestions. How much you enjoy the actual update will depend entirely on how much you enjoyed FIFA 18, since it’s practically the same thing. I like FIFA but don’t love it; I find its ball physics a bit weird and its player animations floaty, and vastly prefer how rival PES performs on the pitch. FIFA 18 vs PES 2018: Which Is Better? But PES doesn’t have the World Cup license, FIFA does, and it’s fine. 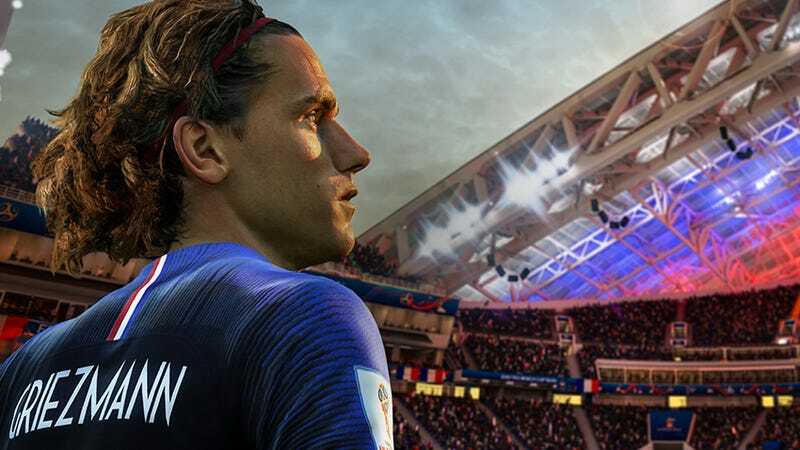 And while World Cup 2018 isn’t as exhaustive as previous cash-ins have been in terms of added flair and detail, those were pricey standalone games that were quite literally looking to cash in. To get an experience that comes damn close to that, only as a free update to a game you probably already own, is one of the steals of the year.